This lovely late season ride is in the north as Iceland’s long summer draws to a close. There’s a nice mix of riding tours out from the host farm, and on some days you'll make sight seeing trips by van to some of the spots which make North Iceland so special You’ll stay in guesthouses at onr of our favorite farms in the north - Grytubakki - for a real taste of Icelandic hospitality. This tour highlights one of our favorite areas - northern Iceland - and it’s based on a lovely northern farm, where you can watch and take part in some of autumn traditions as well as riding out for a last look at the mountainous landscape before winter really settles in. The tour price includes the flights north and all ground transport. After arriving at Keflavik International Airport the Flybus shuttle will take riders into the Reykjavik airport, for a dramatic 45 minute flight to Akureyri, the "capital" of northern Iceland. Here the folks from Polar Hestar will pick up riders for a short drive to their farmhouse Grytubakki for dinner and a good night's sleep. After After breakfast you’ll saddle the horses. You’ll get a short introduction and then start the tour by riding to the historical turf farm Laufás. Laufás farmhouse is a classic example of the turf- gabled Icelandic farms of the past.. It has been a vicarage from the earliest Christian times. After lunch you’ll ride into the Fnjóská river valley. On the way back, have a look at the holy hill Helguholl. According to legend there is a Viking ship full of gold under it, but if someone tries to get it all churches in view of the hill will burn down. Through the marshy country of Nes, ride home to Grýtubakki where coffee and cakes will be served. Late afternoon you’ll be driven to Akureyri where you can relax in the swimming pool, which is supposed to be the most beautiful in the country. After a good Icelandic breakfast you’ll go whale watching in Húsavik and visit the famous whale museum. On the way back you’ll visit the historical waterfall Godafos,s which played an important role during Christianization of Iceland around the year 1000. Coffee at Grýtubakki and afterwards, saddle the horses for a short ride to the Gljúfurá river, before dinner and overnight at Grýtubakki. Today there’s a day ride to the Látrastönd coast above steep cliffs, through clear brooks and wonderful green valleys. You’ll have a lunch break near the ruins of the old Svínarnes farmhouse. Inhabited until the middle of the last century they are witness of former life. Enjoy the amazing view to Hrísey island, Eyjafjördur fjord, and the open sea. Coffee and cake awaut you back at Grýtubakki. Today’s destination is the famous Lake Mývatn. The lake was created by a large basaltic lava eruption 2300 years ago, and the surrounding landscape is dominated by volcanic landforms, including lava pillars and rootless vents (pseudocraters). You’ll visit the pseudocraters of Skútustaðir, the bizarre lava formations in Dimmuborgir, and the bubbling mud pools of Námaskard. A day full of interesting impressions! From the rise of Leirdalsheiði there’s a wonderful view over to Eyjafjörður fjord, Grenivík, the fishing village, and surrounding farms. You’ll ride through green valleys, along rushing rivers, and over stony paths. Extinct volcanoes, silent glaciers, and hidden waterfalls accompany you. In the afternoon you’ll be back at Grýtubakki for a last nights dinner and good nights sleep. The last day of riding: from the isolation of the hut Gil to the warm cheeriness of Grytubakki. Along the way, you may find some of the hundreds of sheep that have spent the summer on these hills. Supper and reminiscences at Grytubakki. You'll have one last breakfast to share stories before saying goodbye to your friends and guides. Then you'll be taken back to the airport at Akureyri for your flight south, followed by a bus from the domestic to the international airport. Then you’ll be back home before you know it! 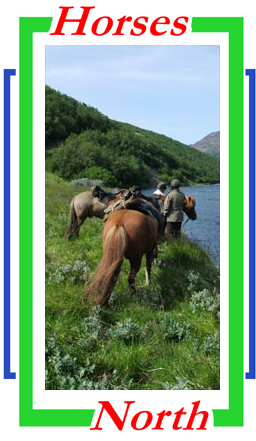 Accommodations on this Summer Farewell ride in North Iceland are traditionally Icelandic. The farm guesthouses, where you‘ll sleep are simple, warm and clean. Typically there are several beds per room with a shared bathroom. A sleeping bag and mattress will be provided. You’ll need to bring towels, soap and shampoo. The outfitter provides helmets and rain gear. Meals will be family style with lots of typical Icelandic cuisine which features fish, dairy products, lamb, and potatoes. Vegetarians can be accommodated with advance notice. We’ll send you a gear list that provides tips for packing, as well as info on converting money and electricity, weather advice (no guarantees, though) and other useful stuff. Summer Farewell runs two times in 2015. Below are travel dates -- we’ll be happy to arrange for an earlier departure or later return. Your arrival day in Iceland is always a transfer day, which allows you to rest from the short night of sleep on the flight, before you start riding on the second day. The price for this 7 day tour is $3125 per person. The price includes round trip airfare, with US taxes and fuel surcharge, from NYC, Boston, and Washington Dulles International Airport (ask for prices from Denver, Minneapolis, Anchorage, Seattle, and Toronto,). The flights to and from northern Iceland are included with most transfers as are accommodations in guest and farm houses with shared baths, all meals, as well as rain gear and safety helmets.